Whilst the EU and the OSCE are two organisations that are very different in nature they face many common challenges and the overlap of membership of the 27 EU member states who form nearly half the membership of the OSCE calls for a more harmonised and more focused relationship. Nowhere is this more the case than in the South Caucasus where the two organisations are involved in multiple ways on wide spectrum of issues involving Armenia, Azerbaijan and Georgia, from conflict resolution to democracy and human rights issues. The European Union is often less assertive in pushing its own positions within the OSCE framework than is sometimes necessary and this sometimes creates a vacuum which is filled by others. 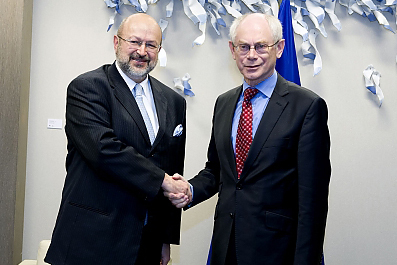 This is partly because the OSCE is perceived in Brussels as a primarily security organisation. Things however may be changing as a result of developments in the EU common foreign and security policy mechanisms and the gradual development of the European External Action Service. One country whose relationship with both institutions is at the moment less than happy is Azerbaijan. The leadership of Azerbaijan has decided to conduct its relations with the two pan European institutions on an “a la carte” basis picking and choosing what it likes and discarding what it does not. This is a luxury that neither the EU nor the OSCE can afford. Reports that Azerbaijan wants to downgrade the status of the OSCE office in Baku to lessen its ability to monitor human rights developments in the country need to be resisted, and the EU needs to make it clear that opposition bashing in Baku, which the Azerbaijani government has turned into a national sport, comes with a high price in terms of relations with the EU. EU enlargement Commissioner Stefan Fule is due in Baku next month, whilst OSCE Secretary General Zannier was there in March. It is important that Baku understands fully the implications of its current actions so that it will not be surprised when it reaps the consequences of its actions. Another flawed election come next October will be the last straw that breaks the camel’s back. There are other areas on which the two organisations need to be working together in the South Caucasus, including on minority rights and ofcourse the resolution of the outstanding conflicts in the region. In a broader context the EU should be spearheading new initiatives that can address the present and future security challenges in the region. The OSCE at its last Ministerial Meeting, opened up the possibility for such initiatives as it prepares to mark the 40th anniversary of the Helsinki Final Act in 2015. Switzerland takes over the Chairmanship of the OSCE in January. It is not an EU member but the closest any country can be to EU values and aspirations whilst being out of the it. This offers an important window of opportunity for new initiatives which neither the EU nor the OSCE should squander. This commentary was prepared by the editorial team of Caucasus Elections Watch. Back in an embrace? The OSCE Parliamentary Assembly says it is back working with ODIHR on election monitoring.